"Explosive, Riveting…", "A Blistering Firecracker" indeed! 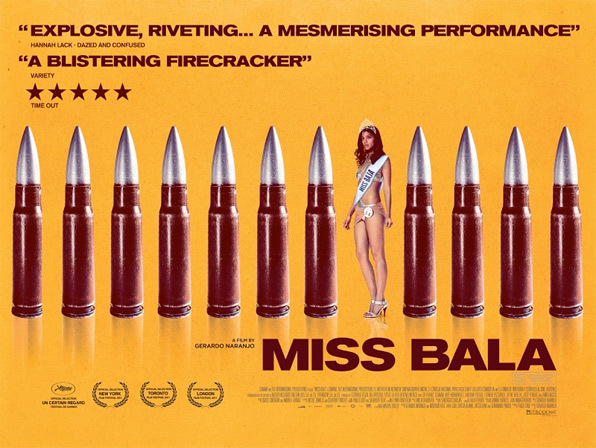 A brand new, grungy yellow colored UK quad poster has debuted online for Gerardo Naranjo's Miss Bala, the Mexican thriller that earned rave reviews in Cannes and played at the Toronto Film Fest this last week. We also just featured the first official trailer for this film a few weeks ago, which is supposedly getting a US release in January, but we still don't know details. Seen on the poster besides the bullets is Stephanie Sigman as Laura Guerrero, a beauty queen wannabe who gets caught in the Mexican drug wars. One of my favorite indie gems of the year, check it out! Thanks to Empire for debuting the poster. If you haven't seen it, watch the first trailer for Miss Bala here.